There’s something very satisfying about stitching with beads. I love the meticulous work of embellishing one little bead at time. And while many of my bead projects take considerable time, these little heart pins are small enough to whip up in one sitting. Read on to find out how to make some of your own. 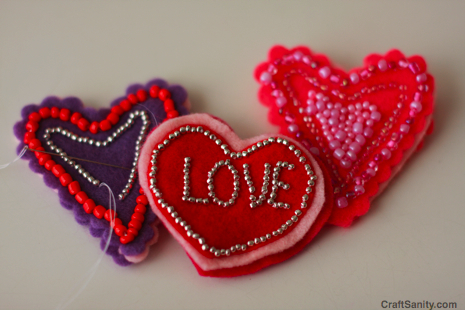 Cut felt into heart shapes and make stacks of about three layers per pin for stability. Pin the stack of felt together with a straight pin and begin stitching beads around the perimeter of the shape with hand quilting thread. Continue to fill in the center with more beads or a text message like “LOVE” or “Be Mine.” After all the beads are stitched on, sew a pin back to the reverse side and you’re good to go. Below is the clip of the craft segment I did this morning on WZZM Channel 13 “Take Five & Company” demonstrating how to make these pins.